MapFileStats provides simple binary size statistics from .MAP files (any Delphi version up to at least Delphi XE5). “.map” files can be produced by Delphi during the linking phase, they provide symbolic information on the executable they were generated for. 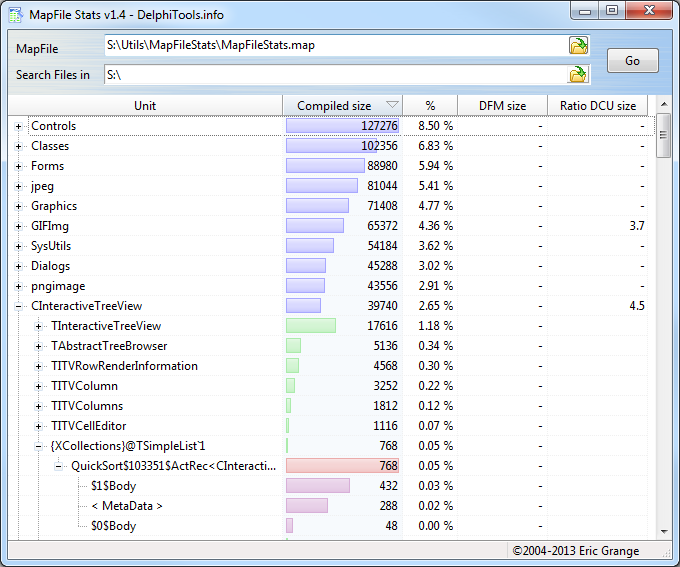 MAPFileStats uses them to compute statistics on the compiled executable binary. Compiled Size: the size in bytes taken by the unit’s code in the executable. DFM size: the size of the DFM file associated to the unit. Ratio DCU Size: the ratio between the size of the DCU of a unit, and its compiled size. Intended to locate units you depend on, but from which you use only a fraction of the code, corresponds to the size of the first matching DCU file in the search path. MapFileStats can be integrated into the Delphi IDE tools menu, use $EXENAME in the parameters field to have it open on the current executable project’s MAP file. 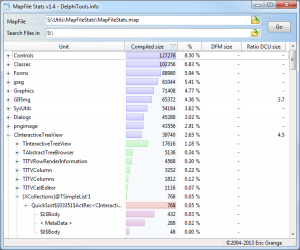 Don’t forget to enable MAP file generation in your project’s linker options, the smallest & fastest MAP file generation option (Segments) provides all the info MAPFileStats currently uses. Graphics competition, two days left to register!